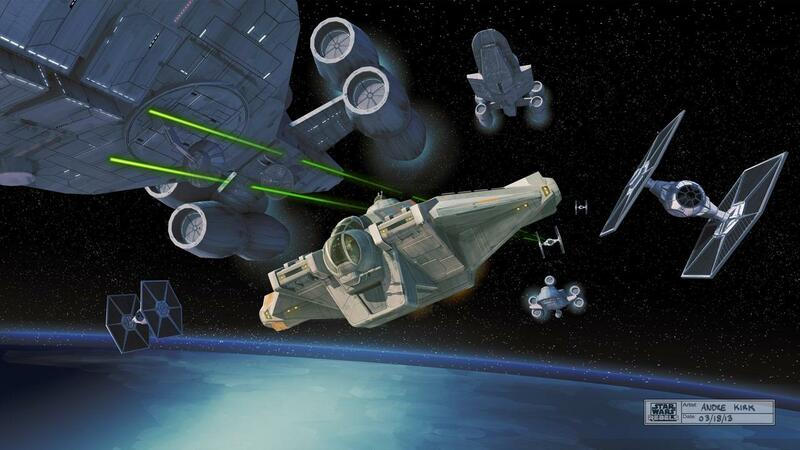 Late last month at the Star Wars Celebration Europe 2013 event information and some new conceptual artwork was released for the upcoming Star Wars Rebels animated series from Disney XD. Star Wars Rebels Executive Producer Dave Filoni pulled back the curtain on Lucasfilm's highly anticipated animated series for Star Wars Celebration Europe attendees today, discussing the huge influence of original Star Wars concept artist Ralph McQuarrie on the look and feel of the show, and revealing the series' unique logo and select designs. 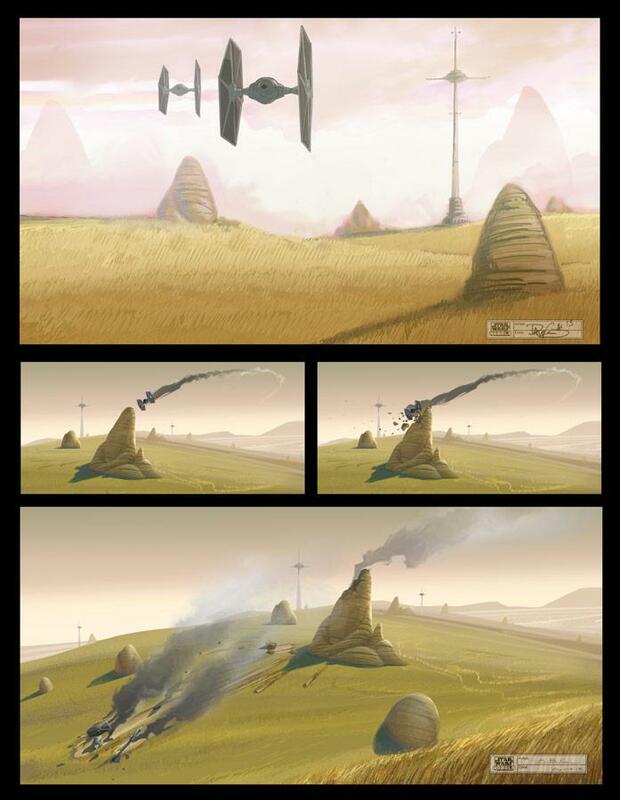 Filoni talked at length about the use of McQuarrie art as a springboard for the series, showcasing many works from the original trilogy, including landscapes and characters, and detailing how they inform the visual identity of Star Wars Rebels. For Star Wars Rebels, fans were given their first look at the Ghost, which will be the main character's ship and play a big part in the series, as well as a computer rendering of a very McQuarrie-esque Stormtrooper, the interior of a Star Destroyer, and more. The show's logo, a minimalist yet powerful design, is notable for its orange and black color scheme, which recalls the flight suit colors of Rebel pilots in the original Star Wars trilogy. While unable to attend in person, Executive Producers Simon Kinberg and Greg Weisman shared their excitement for the series in a video message recorded specifically for Celebration attendees. The series is set between the events of Episode III and IV -- an era spanning almost two decades never-before explored on-screen. 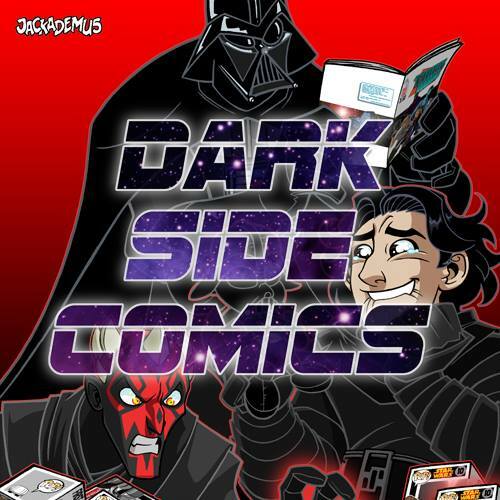 It takes place in a time where the Empire is securing its grip on the galaxy and hunting down the last of the Jedi Knights as a fledgling rebellion against the Empire is taking shape. Star Wars Rebels will be produced by Lucasfilm Animation, featuring many of the key talents that made Star Wars: The Clone Wars. It is scheduled to premiere in fall 2014 as a one-hour special telecast on Disney Channel, and will be followed by a series on Disney XD channels around the world.